It has been exciting times this past week in Rochester, MN with the week-long Rochesterfest in town. Rochesterfest celebrated its 25th year this year and brought back many of my favorite events including The Midwestern Lumberjack Championships, The Grand Parade, and Mayor’s Cup Balloon Race. I realize that we aren’t talking Football, Fireworks, and Ice Cream here but the Rochesterfest events have a certain small city festival feeling that is pretty cool. The week started with the Lumberjack championships, now I know that it sounds kinda Wisconsiny to goto a Lumberjack Competition, but it is cheap, entertaining, and in an awesome setting at one of the only Lake’s in Rochester. Plus, where else can you see One-Man Bucking? I would explain the events but it would be much more boring then just checking out the photos (you can also check out pics from the 2005 competition here). As I said, Rochesterfest is a week long event. However, other then lunch on Thursday at the street vendor’s downtown there isn’t much that we goto during the week. Plus, this year the week was much busier for me because I was working with the Marching Band Monday, Wednesday, Friday as they prepared for the Parade. Speaking of the Parade it took place on Friday night and both Amber and I were in it walking along with the Rochester Lourdes Marching Band (which we help out with). The Rochesterfest Parade is a very interesting experience, it lasts for about 2 hours and there are HUGE gaps between many of the entries. This year I learned one of the reasons why this happens. For many of the bands that march the parade, it is a judged parade competition (I am sure I will be writing much more about Marching Competitions once the field season starts next fall). For those of you unfamiliar (as I was), parade competition bands learn and march drill just like field show bands, the difference is they travel around to parades all summer competing instead of competing at shows in the fall. Here is where we get to the gaps, the band’s shows are designed to be performed in front of a judging station, this means every time they stop to perform it consumes about 5 minutes. The bands try to catch up as best they can, however I heard that this year one band had an 11 minute gap in front of it by the end of the parade. Here is some video from the parade of the Lourdes Marching Band, they did well. Keep in mind that we just recently started rehearsals and will keep going through the entire summer, so this is just the beginning. Today we did our final Rochesterfest events, the Mayor’s Cup Balloon Race (no, they don’t actually race) and Breakfast on the Farm. We were up at 5AM to get out to the Balloon launch (which didn’t end up happening until 6AM). Why do we get up so early to watch hot air balloons? Because we are idiots 🙂 Plus, it is a fun time and having to get up early just adds to the fun. As always the photo ops are a-plenty. Seeing as how we were already up, we went to the Breakfast on the Farm. This was the first time we went to this event (it was the first year we were up early enough) and I have to say it was really impressive. It is your standard pancake breakfast, but they feed over 3,000 people. It was interesting to learn from Amber that they have never had this event at the same area farm twice in over 20 years. Kinda gives you an idea of the vast nothingness that surrounds Rochester. “There is a truck in our yard”, That is what Amber said when she called me at work this afternoon. At first I thought she meant that someone had parked over the curb a bit and onto our lawn. Then she started talking about the recycling bin being crushed and I thought to myself, “Why would someone run-over our recycling bin?”. At this point she told me that the truck hit one of the trees in front of our house, I finally understood the scope of what she was talking about. Sometimes my slowness is astounding. While Amber checked the car for passengers (there were none) and called the Police (because we figured that is what you do when someone parks their truck in your tree), I headed home from work to help her sort it out. Driving home I had plenty of theories about why there was a truck in our yard. 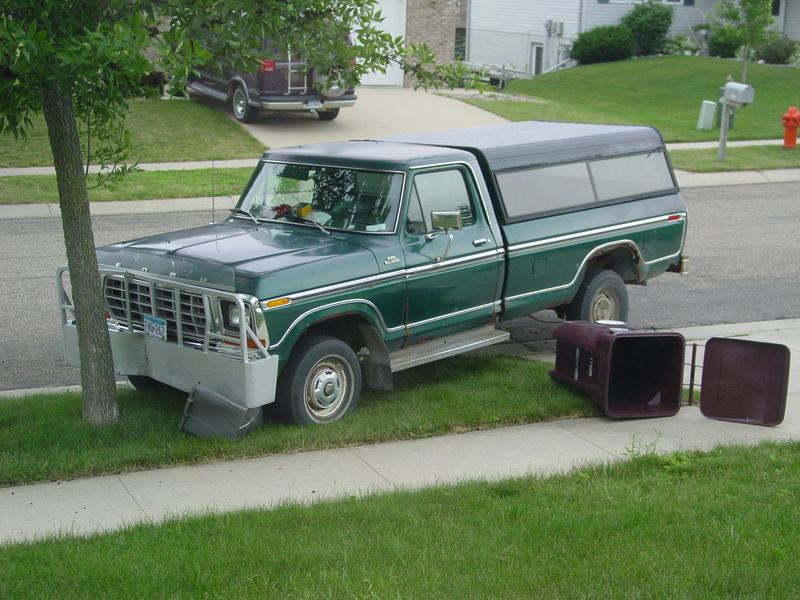 I figured that it couldn’t have been a sober adult because if you accidentally drove your truck into my tree you would either knock on the door ad fess up (which I would prefer), or you would immediately drive away (dragging away my recycling bin). I thought about an intoxicated adult, but then why would you run? And if you were drunk enough to park your truck in my tree, I would imagine you couldn’t run very far before ending up on your face. The most obvious choice to me was that a neighborhood kid, of which there are plenty, went on a joy ride that ended with an amateur parking job in my tree. It just so happened that at almost the exact moment I arrived home, I also learned how wrong I my theories were. After meeting Amber in our front yard (that had a truck parked in it) and talking about a variety of topics mostly surrounding the fact that there was a truck parked in our tree. A neighbor from a few houses up the street comes running out her front door, very curious as to why the truck she parked on the street a few hours before was now parked in my tree. Apparently, she had borrowed the manual transmission truck and was given instructions not to set the parking break. An old transmission and gravity took care of the rest. Luckily no one got hurt and the truck didn’t make it to the intersection at the end of our street. The tree held up like a champ with only minor bark damage and the remarkably springy recycling bin was, well, remarkably springy. So other then losing 15 minutes of work and wasting a few minutes of the Police’s time, no harm was done (Well except to the front of the truck, but come on everyone knows you set the parking break on manual transmission’s, especially on a hill). For those of you who don’t know, Mr Wizard died yesterday morning at almost 90 years of age. For those of you that don’t know who Mr Wizard is (hopefully the graphic helps), think Bill Nye in a 1980’s setting, at least that is who he is to me. 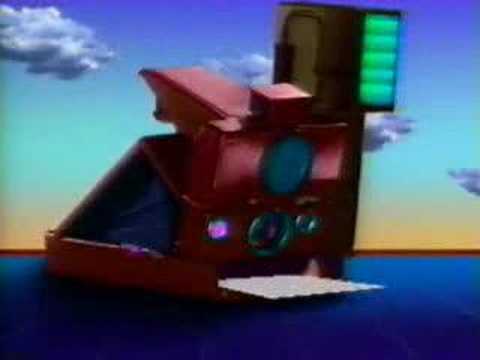 I can still remember watching Mr. Wizard’s World on Nickelodeon when I was a kid, the magical experiments, the corny animated transitions, and the even cornier futuristic 80’s music. Mr. Wizard is where I first learned about chemistry, physics, and probably the first place I saw anything resembling a computer or robot. It wasn’t until today when I was reading up on Mr. Wizard that I learned about what a full career he had before the 1980’s. Mr. Wizard whose real name was Don Herbert was born in Waconia, MN (which is about 2 hours from Rochester, straight West of the Twin Cities) before moving to the Twin Cities and finally Lacrosse, WI. Mr. Wizard graduated from State Teachers College with a degree in English and General Science, but instead of going into teaching he decided to go pursue acting and moved to New York City in 1941. Being a young man in 1941, he did what a large number of young men did and volunteered for service, specifically he served as a pilot performing 55 bombing missions over Northern Italy before leaving the service in 1945. After his service, Mr Wizard went back to acting and various other jobs in the entertainment field before starting “Watch Mr. Wizard” in 1951 in Chicago. “Watch Mr. Wizard” continued with great success until 1965 when NBC canceled the series (that I never knew existed). For the remainder of the 60’s and 70’s Mr Wizard did a variety of things, writing books, making classroom videos, special appearances, and even a few other TV shows. In 1983 “Mr. 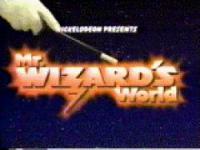 Wizard’s World” was picked up by the new and fledgling Nickelodeon Channel and continued for 7 season ending in 1990, with reruns continuing until 2000. I can still remember getting up for zero-hour in high school at 6 AM and watching re-runs. There have been plenty of educational shows for children, but Mr. Wizard was special because he never talked down to children. Something if you watch the educational programming on Nickelodeon today you know they do all the time. How they went from a man planting the seeds of interest in science, math, and technology to a talking television screen and a blue dog is probably something that should be examined. That alas, is not the point of this post. Today I say good-bye to a good friend from my childhood, Rest in Peace Mr. Wizard. Check out Mr. Wizard’s Official site here, with all sorts of interesting information. So I realize that it has been a few months since I started this thread of posts, and it is my goal to get them finished up soon. The first hurdle we had to get over was life without digital cable, having been in that mode now for a few months I am here to tell you that digital cable is not all it is cracked up to be. I am getting ahead of myself though, what did this change mean to us? No Pay channels – We had them all, Showtime, HBO, Cinemax, even Starz, Encore, and TMC. My original plan was that I would get Netflix to offset losing these channels and the hole it would undoubtedly leave in my life. Honestly though, it hasn’t bothered me enough yet to warrant that. The nice thing is, it is always an option once winter rolls around. No HD – This was surprisingly easy for me to live without, I hit a few quality issues (that I will talk about later), but all-in-all tv is tv and none of it’s entertainment value comes from it’s quality. The flip side here is that HD is always an option on the MythTV Box, so if I start to miss it I can always put it there. No Upper Channels – This was really easy, didn’t change my life at all….good riddance. No On-Screen Guide in Bedroom – The Moxi still attached in the living room, we didn’t have this problem, but in the bedroom were we went from a cable-box to nothing, this was an unexpected adjustment. It kind of brought me back to being a kid and just organically memorizing channels and basic schedules. The nice part is that because it is in the bedroom there are only a few thing we normally watch anyway. This simple change dropped a little over a third off our cable bill (cost of the MOXI went up when I dropped digital cable) and we survived just fine. Now onto the fun stuff! How do they keep the birds out? 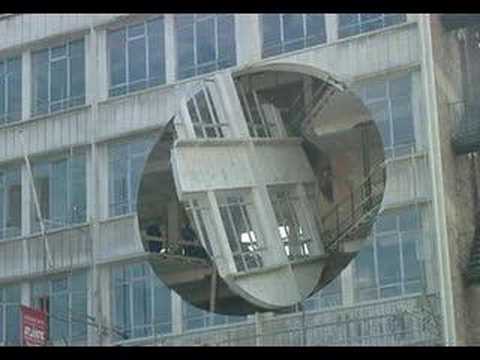 This is an interesting video from Liverpool. It is really quite an impressive piece of engineering considering it has no practical use at all. Although I have to say, if you are going to spend $900,000 on a piece of art, this beats a sculpture any day.